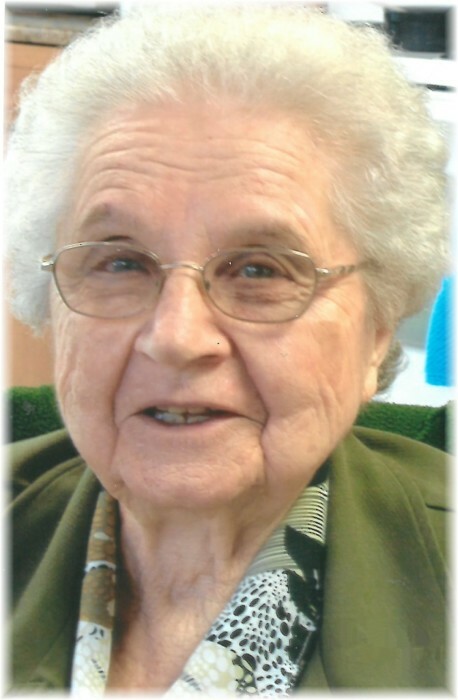 Peacefully on April 2, 2018 our beloved mother and grandmother Anne Burtnyk passed away at the Grandview Personal Care Home at the age of 88 years. Anne was predeceased by her loving husband Steve, mother Lena & father Michael Hawrysh, and brother Walter Hawrysh. Anne will be sadly missed by her daughters Esther, Penny, Peggy (Gordon); grandson Corey (Kelly); her sisters-in-law Emily Bataluk, Ann Klemack, Alice Gorlick, Adeline Jackson, and Shirley Burtnyk as well as by numerous nieces, nephews, extended family and dear friends. Anne was born to Lena & Michael Hawrysh on November 17, 1929. Anne was united in marriage to Steve Burtnyk on September 29, 1946. Together they spent most of their life farming and raising their family. Our mom always kept busy, worked hard and had several projects on the go at any given time. She loved to garden- that was mom's passion, also she loved to cook and bake and she spent most of her life doing just that. She always made sure we left with a goodie bag filled with perogies, cabbage rolls, cinnamon buns and plenty of garden goods and everything else!! Mom was strong and independent and she instilled those values in us. She was proud of her entire family. Our mom is finally at peace. Two hard working hands at rest. The family wishes to thank the doctors, all the nurses and all the staff from the Grandview Personal Care Home for their compassionate and professional care. In lieu of flowers donations in Anne's memory can be made to the Alzheimer Society of Manitoba or to a charity of ones choice. "When the day comes that no more tomorrows I shall see, one of the biggest regrets will not being able to be there at your side should you need me. My wish for you then will always be, that your lives are long and happy, and that you follow your dreams wherever the road may lead. When you look back and I am but a memory, I pray that you always remember that you were, are and always will be deeply loved by me." Funeral Liturgy was held on Saturday, April 7, 2018 at 11:00 am from Sts. Peter and Paul Ukrainian Catholic Church in , with Rev Father Yaroslav Strukhlyak officiating. Interment followed in Sts. Peter & Paul Ukrainian Catholic Cemetery in Ethelbert, Manitoba. Pallbearers were Corey Burtnyk, Gordon Boychuk, Tom Jackson, Eddie Klemack, Doug Proch, Art Potoroka.